Puppies are really cute. Puppy potty messes are not quite so cute. The fact that puppies are so cute is probably what helps puppy owners tolerate the messes. But still, it is just natural to want to stop those messes as soon as possible by learning how to potty train a puppy fast! Luckily, you have plenty of tried-and-true methods to choose from to help your puppy learn good potty habits as quickly as possible. It doesn’t matter which one you choose, so long as you see the desired results. However, it is also important to retain patience in potty training and focus on rewarding progress rather than perfection. The occasional puppy accident may be inevitable through the first year of life while your puppy’s nervous and elimination systems are still maturing. In this article, learn more about how to achieve the fastest possible results from your puppy’s potty training program. There are several good reasons to let a new puppy stay with its mom at least through the first 8 to 12 weeks of life. For our purposes here, however, the most compelling reason has to be potty training. A puppy first learns how to eliminate from its mother. As Austin’s Animal Foster Care Services points out, for the first 3 weeks, a puppy won’t know when it needs to go to the bathroom. This is because those reflexes have not developed yet. The mother will remind the puppy to eliminate by licking and cleaning the puppy after nursing. In this way, during the 5 to 15 minutes following nursing, the puppy will do its business. Starting around four weeks when a puppy’s eyesight matures and it has sufficient reflexes to begin cleaning itself, the puppy’s mom will start the weaning process. During this time, she will also encourage her puppies to eliminate away from the area where they sleep. As you can see, the more time your puppy is able to spend with its mother, the more of the preliminary potty training work she will do for you! So when you finally do take your puppy home, your job will primarily be one of timing and reinforcement, rather than having to start the whole process from scratch. Are there any difficult breeds to potty train? It can be easy to assume that if you simply follow such-and-so method, your puppy potty training process will go smoothly. But sometimes you may find your puppy has other ideas. Because puppy potty training is a topic of universal interest to puppy owners, lots of data exists regarding whether certain dog breeds represent more of a challenge during potty training. If your puppy happens to hail from a breed known for problematic potty training, don’t despair (and certainly don’t beat yourself up when listening to your friends who have puppies whose potty training went flawlessly!). Small dogs in general tend to be more resistant to potty training. There are several reasons for this, including their smaller bladders, independent natures and aversion to inclement weather and leashing. The more confident and consistent you are as an owner with any puppy – and certainly with these breeds – the more consistent your efforts to learn how to potty train a puppy fast will pay off. When should you begin potty training? So what age is the right age to begin the potty training process? And should you get started right away on day one, or give your puppy a day or few to get settled in first? The answer to the second question will depend on how long you want to tolerate accidents in the house. The faster you start potty training, the fewer accidents will occur. The answer to the first question, according to WebMD Pets, is between 12 and 16 weeks of age. This period of time is ideal because your puppy’s body and nervous system has developed sufficiently to generate fairly reliable elimination reflexes. However, it may still take longer for your puppy to fully recognize what those reflexes are signaling and act on them promptly. The younger your puppy is when you begin potty training (within or earlier than that initial 12 to 16 week window), the more accidents you may have. But still, sooner is always better, even if your puppy is just 8 weeks old. Your puppy will get the hang of connecting reflex to elimination to action more quickly with earlier training and reinforcement. Now that you have a better understanding of how and when your puppy’s nervous and elimination systems develop, what a puppy’s mom can add to the potty training process, which dog breeds may be more of a struggle to potty training and when to begin learning how to potty train a puppy fast, let’s dive in and get started! This first step lays out the ground rules for your puppy. Where can they go to eliminate and where can’t they go? If the puppy did not learn from its mom not to go in the same place that is used for sleeping and resting (typically, a den or crate), this is your first order of business. Next, designate an outdoor area that is always to be used for elimination. This area should be close to the main area where your puppy spends most of its time. It should also be the same place every time. There are many systems in your puppy’s body that are still growing, developing and maturing. For this reason and others, your puppy will thrive with a consistent diet made up of consistent portions offered on a consistent schedule. Offering feedings at the same time each day will be a great help when you are potty training, since your puppy’s digestion and elimination systems will become “programmed” to eat and eliminate on cue. While you will instantly understand that the designated elimination area is the “toilet,” your puppy likely will not. Part of the potty training process will be to help your puppy understand what that area is for and what should be done there. In the beginning stages of life, your puppy’s bladder and bowel will be smaller than it will be as an adult. So initially, your puppy will have less “holding capacity.” What goes in will come out again with a great degree of rapidity. According to the American Kennel Club (AKC), a good general guide to follow is that your puppy will be able to hold it for the same number of hours that matches their age. For instance, a six-month-old puppy may be able to hold their bladder and bowel for up to six hours. However, this is not meant to serve as a hard and fast rule – more like a guideline. In particular, smaller puppies may have a lower holding capacity than bigger puppies do. Rather than relying on your puppy to put two and two together and beg to go out, during potty training you should provide regularly scheduled breaks, especially first thing in the morning, last thing in the evening, after a nap, after any confinement time and no more than five minutes after the conclusion of any meal. In addition, you should offer regular breaks at least once per hour throughout your puppy’s waking hours. You will probably need to let your puppy out at least once or twice during the sleeping hours as well, especially right at the beginning of the process when you are both still learning. It is important never to leave your puppy alone until you have achieved a large degree of success with potty training. Every unsupervised accident will serve as a negative reinforcement to undo the potty training lessons you have taught your puppy up to that point. Ideally, you want to catch your puppy before the need to eliminate becomes urgent, at first by simply providing regular breaks and later also by beginning to learn your puppy’s signals for a need to eliminate and acting on them. While there was a time in the early life of professional dog trainers when punishment (or negative reinforcement) was a favored approach, those days have largely passed. In fact, a puppy will most likely not associate a punishment-type behavior, such as yelling, rubbing their nose in their mistake or “time out” confinement as associated with the potty training oops. Instead, all that negative reinforcement is likely to accomplish is to generate fear and distrust between you and your puppy. Today, the most effective training is thought to be reward-based, where your puppy is seen as a willing partner in the process in exchange for a variety of rewards, including praise, pets, play time, food treats and other canine delights. Always offer a reward right after your puppy eliminates in the toilet location to reinforce that behavior. The very best way to deal with your puppy’s inevitable initial potty training oopses is to simply ignore them. Clean them up, using a very strong disinfectant that can also thoroughly deodorize the area. This will prevent your puppy’s sensitive sniffer from re-encountering the spot, noticing the odor and assuming this is an okay spot to eliminate. When you catch your puppy in the middle of an inside oops, it will likely be tempting to overreact with frustration. However, other than a semi-loud clap that can startle your puppy into stopping the elimination-in-progress (think startle, not provoke fear), you should do your best to stay calm. Remember that the best and most positive way to respond is to simply pick your puppy up and remove them to the designated toilet spot, let them finish the elimination and then offer praise. You can then return to clean and deodorize the indoor spot. In the early nursing days when your puppy relied on its mom to stimulate elimination, there was never an odor of elimination in the nest area. Your puppy’s mom would always lick and clean the area thoroughly after her puppies eliminated. This is especially true if you have some or a lot of indoor carpeting. Once your puppy has eliminated outside a few times, it will likely come to associate a feeling of softness under the paws with “grass.” Carpet can simulate this effect – and even more so if there is a lingering scent of a past oops on that carpet. Finally, as previous sections have highlighted, consistency is absolutely key to the speediest and most successful puppy potty training experience. Choosing a key word or phrase such as “hurry up,” “do your business” or “go potty” can help your puppy learn to associate the place with the act faster. Pay attention to notice which phrase your puppy seems most responsive to and begin using that phrase only. Take a look at these must have products that I wouldn’t potty train without. This stuff works great to get up those messes. If you don’t clean an area properly after an oops, the remaining scent might encourage your puppy to go there again. This is a MUST HAVE when training. Depending on your puppy’s size, breed and age, you may need to retain the services of a puppy sitter or dog walker during the initial stages of potty training to avoid too many negatively reinforcing oopses. This can be particularly true if you work outside the home or attend classes. However, when you do need to be gone and no one else is available to help with puppy potty training, you can lay down puppy pads in the area where your puppy is confined in the den or crate. The key to success here is to find an area for confinement that allows for some small space between the den or crate itself and the area where the puppy pads are located. This can continue to serve as a positive reinforce to your puppy to go on the pads and not in the den. If your puppy seems to be proceeding through the puppy training process in record time and with stellar results, you can begin offering additional freedom at any time. Begin with giving the puppy access to one more room at a time, but only when supervised. If you cannot supervise the puppy, put him back in the den. But your puppy should always have to earn it by continuing to eliminate in the right place within a very short time (generally, 3 minutes is sufficient). Some puppy owners wonder if installing a doggy door will help make the puppy potty training process go faster and more smoothly. DogGoneGood describes an innovative way to crate train and potty train at the same time. Take your puppy’s crate or den and remove the door. Then push the den or crate right up to the doggie door. Right outside the doggie door, install a puppy-proof fence that confines the puppy within an area of grass. Now, your puppy can walk out the doggy door and eliminate on the grassy area. Of course, this only works well if you happen to have (or can arrange to have) grass right outside of the doggy door. But in general, doggie doors are a favored choice among canine owners to help puppies and dogs take charge of their own elimination needs. If your puppy happens to hail from a toy or small dog breed, you may never get to the point where there is a long span of time in between drinking or eating and a need to eliminate. Nervous temperament, small bladder or bowel and other factors can conspire to keep your puppy going on a more frequent basis. But even if you live in an apartment or a hi-rise that makes quickly accessing a designated outside grassy area difficult or impossible during potty training, you don’t have to let this stop you from being a puppy owner! 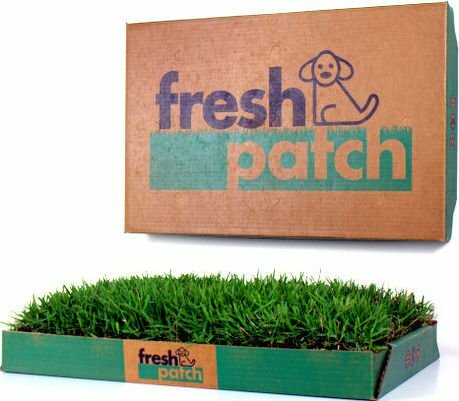 With new products like the Fresh Patch Disposable Dog Potty with Real Grass, you can turn your balcony or an unused spot in your bathroom into the designated area and simply proceed on with potty training! “Potty training my puppy went flawlessly – we never had any accidents!” said no puppy owner, ever. There will be oopses – count on it. By putting yourself in your puppy’s shoes, in essence, you can retain patience and a good sense of humor about the whole process. Of course you want to get your puppy potty trained as fast as possible, since no one likes to clean up indoor messes. But most importantly, you want to build a bond of trust with your new puppy that will last a lifetime, and that is something worth working towards and waiting for!